Armored Brigade Is Officially Announced! Re: Armored Brigade Is Officially Announced! Western Europe is on the brink of a direct confrontation with the Warsaw Pact. Diplomatic relations have worsened to a level never witnessed before. Rumors of intensive military exercises conducted by Soviet officials in many Eastern countries have finally convinced NATO members about the reality of a quick escalation. The clock is ticking. Are you ready to do your part? Armored Brigade, the upcoming real-time tactical wargame developed by Veitikka Studios, has reached an important milestone. On Monday 8th October, we will show live the game on our official Twitch Channel, at 6pm BST. XTRG, special guest for this event, will guide you through the game, showing and exploring many of the key features Armored Brigade has in store for you. To even more celebrate this important occasion, we will reveal the epic trailer everyone was waiting for. Do you want to know more? Read the Dev Diaries! It's time to go back to the Cold War, with another great Armored Brigade Twitch Preview! Join us Tuesday 16th on our official Twitch Channel at 6 PM BST and watch XTRG featuring the US Army! We are receiving numerous HUMINT and SIGINT reports on suspicious activity behind the Iron Curtain of Matrix Games. Our sources confirm that their highly anticipated wargame Armored Brigade is entering the final stage so release seems near the corner. Synchronize your clocks as "Operation Release" will begin on November 15th. The Soviet General Staff has some ideas regarding the Western Nations, and I'm afraid none of them involves peaceful relations. Join us on October 23rd on our Twitch Channel as XTRG is going to play Armored Brigade, featuring the mighty Red Army! Did you miss the previous episodes? Check them out ! It's time to reveal the soldiers of Her Majesty! Join the developers today on their official Twitch Channel at 6PM GMT and make sure to bring a lot of tea! Now that’s what I call an impressive and slick battlefield/map interface. Very well done. Super immersive and very intuitive. I have been playing it Frankie. Armored Brigade – our upcoming tactical wargame set during a Cold War turning hot situation - has a perfect combination between straightforward design and gameplay complexity. Movement Orders are a perfect example of this. In this short video, we are going to illustrate how to command your units to move on the battlefield, considering numerous factors as delays, unit behaviour, speed, and more. Join Slitherine today November 6th on their Twitch Channel as XTRG is going to play Armored Brigade featuring the Nationale Volksarmee from the DDR! 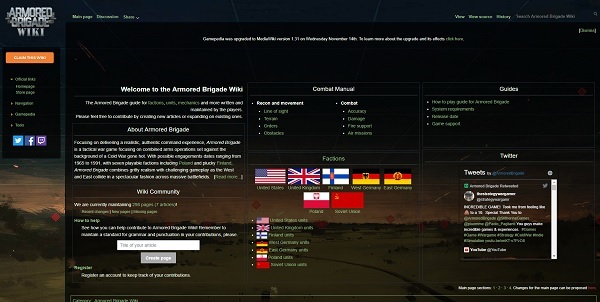 Armored Brigade has an incredible database of units and equipment. With over 500 ground units to choose, accurate realism and flexibility are guaranteed. Today we would like to show you a glimpse of the amount of information the system takes into account, namely some unit’s specs. We have taken one unit per faction, showing the relevant data of each one of them. They are not intended to be an a priori representative of their faction, but we think that they will be able to depict properly the developer’s sheer commitment in delivering the most accurate tactical wargame on the Cold War. Armored Brigade will be available on November 15th. Only 24 hours to the release of one of the most anticipated wargames of the year. Armored Brigade will be released tomorrow and we know that many of you will find tons of fun with it! If you are on the fence or just want to see more, here’s below a short list of Previews and Gameplays done so far. Or, you can watch our Playlist of Twitch Streams made by XTRG. Armouredred Brigade, one of the most anticipated wargames of the year,is now available on our store. The Cold War has turned hot, and Europe is once again torn apart by conflict. Take command of the deadliest mechanized formations available during an arc of time spanning from the Kennedy-Chrušcev confrontation to the final years, and fight your opponents in large and detailed maps. Weather and visibility all play a role and with several munition types, including air to air combat and artillery, no battle will be the same. Do you want to see the game in action? Join us today at 6 PM BST on our official Twitch Channel! Will XTRG be able to stop the Red Tide or will he lead it? And don’t forget to go to the official Wiki page! We'll need your help for populating the Wiki with the staggering amount of information that the game comes with. With your help, we can get the Wiki up and filled in no time, and then new players will be able to find all kinds of information and useful tips on it.